Leading off today: Olean senior Sara Pfeiffer poured in a school-record 63 points Tuesday to lead the Huskies' 89-56 girls basketball victory over visiting Maple Grove. 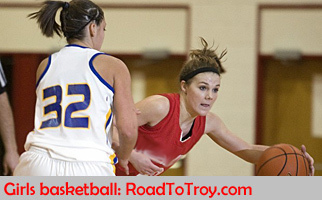 Pfeiffer scored 34 points in the first half and 18 more in the third quarter. Felice Mann of Buffalo Burgard set the Section 6 record of 73 in the 1989-90 season. Unbeatens tumble: At least four Upstate squads saw their undefeated runs come crashing to an end. • Sophomore guard Marianna Freeman scored 16 points and Taylor Norris chipped in with 15 points and 11 rebounds as Bishop Kearney, the class of Section 5's large schools, defeated Penfield 64-51. Baylee Teal scored 21 points for Penfield (15-1), which never led after falling behind 7-0. • The final Section 3 unbeaten tumbled as host Onondaga edged Weedsport (17-1) 56-51 as seventh- grader Riley Cox scored 19 points. Macey DeOrdio and Avi Baker added 14 points apiece. Onondaga went 16-for-19 from the free-throw line. • West Genesee avenged an earlier overtime loss by beating Syracuse Corcoran (16-1) 65-63 with the help of a controversial bucket at the buzzer. Wildcats guard Will Amica (17 points) drove the length of the court in the closing moments but lost the ball. Jack McLane gathered it at the baseline and put home a seven-footer to set off a celebration. Officials counted the tie-breaking basket, but Syracuse.com reported video seemed to show the ball still in McLane's hand as time expired. West Genesee was coming off a 15-point loss to Baldwinsville the previous night. "I didn't realize it was good until my teammates rushed me," said McLane, who finished with 13 points. "We haven't had the best week, so to get this win against an undefeated team is incredible." 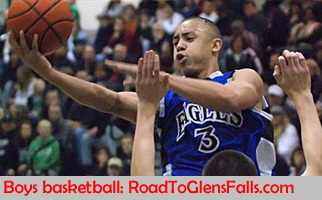 • In Section 5, Class AA Bishop Kearney outlasted Class A Northstar Christian 87-83. Kearney never trailed after junior forward Kidtrell Blocker made a pair of 3-pointers for an 8-6 advantage and went on to score 38 points overall. Four Blocker 3-pointers game Kearney a 76-64 lead with 3:30 to play before Northstar (16-1) pulled closer with an 11-3 run. Northstar's Miles Brown scored 26 in the loss. flipped his college football choice from Air Force to Pittsburgh. Dennis switched to linebacker last fall at The Peddie School in New Jersey, where he also played some quarterback and defensive back. Today is the first day of the regular signing period for Division I scholarship players. "Growing up in Syracuse, I was a big Big East fan and I always watched the rivalry between Syracuse and Pitt," Dennis said. "I didn't dislike Syracuse, but for some reason I always loved those teams that were rivals against Syracuse. So then when I was a rising junior, I went to a Pitt camp and I remember really liking it. I said, if I ever get a chance to come here, I'm going." It was inevitable: The Alabama House of Representatives has introduced a bill that would give the state school board more say in athlete eligibility matters. The bill comes in the wake of the case of Maori Davenport, who was ruled ineligible to play for violating the Alabama High School Athletic Association's amateur rule after she cashed a check from USA Basketball after competing in an international tournament. The bill from Rep. Kyle South would require the Alabama Board of Education to review and approve rules proposed by the AHSAA relating to participation. Additionally, the bill allow the state superintendent of education or the state board of education to appoint a quarter of the AHSAA's governing Central Board. AHSAA Central Board of Control president Johnny Hardin said that the AHSAA already has a system in place that would allow for changes to made to the amateur rule.